Michelle and I took Lorenzo, Cachita & Javier for a long walk in the evening and there were tons of people on the beach! Quite the contrast from my other photos of Woodbine Beach from last summer, but it was Canada Day, so we expected as much. We eventually made our way to the off-leash area so Cachita could go for a swim and boy, was that water ever freezing cold. It was so cold, in fact, that it actually hurt! Right when we were getting ready to walk back home and were getting the dogs back on their leashes, (Lorenzo and Cachita were already on a leash) this big Golden Retriever came over and started playing with Javier. It was quite a funny sight to see – Javier, a 4kg/8.8lb dog running after a 40kg/88lb dog… The big dog just wanted to play, but he was still a little afraid of Javier and his cartoon bark. Too funny! On our walk back home, we saw tons of people making their way down to the beach to watch the fireworks, which we could hear from our house later that evening. Can you imagine how much more packed that beach must have gotten? 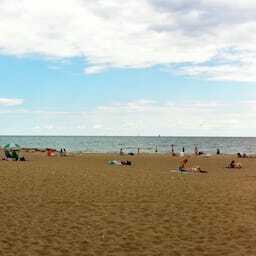 Woodbine Beach — Canada Day 2011 was published on Saturday, July 2, 2011 at 11:22am EDT by Daniel Menjívar and last updated on April 11, 2018 at 9:30pm UTC .